Sandro Marcos: Too Young for Senator but Not for Congressman or Governor? Governor Imee Marcos discloses earlier that she and her mother try to convince Bongbong Marcos’ son to run for public office. Among the three siblings, it is Sandro Marcos who is in the limelight. He is definitely too young to run for Senator with the age requirement of 35. He ‘s only 24. Besides, Gov. Marcos is likely the clan’s candidate for 2019. However, his supporters already launch the Sandro Marcos for Congressman movement. 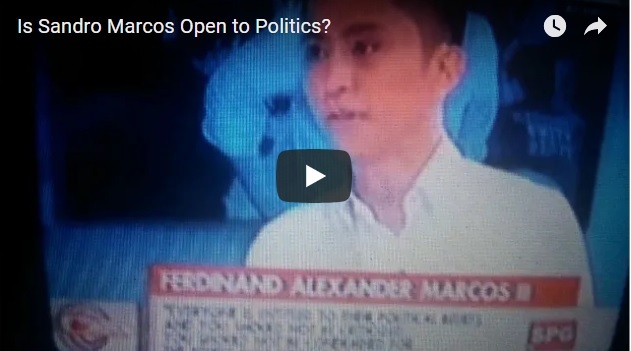 [VIDEO]: Sandro Marcos speaks about his political views. A Member of the House of Representatives must be a natural-born citizen of the Philippines. On the day of the election, he is at least twenty-five (25) years of age. A registered voter in the district in which he shall be elected, and also resident. Ferdinand Alexander Araneta Marcos III or Sandro’s birthday is on March 7, 1994. That would make him exactly 25 in 2019. Under the Constitution, elections for the members of Congress occur every second Monday of May every third year after May 1992. So, the next ones would be in 2019 and 2022. The age requirement for governor is only 23. Since Governor Marcos seems to run for Senator, a candidate from the Marcos family is needed. The rest of the younger Marcoses are reluctant to run for such posts. This can be another option for Sandro. Sandro Marcos has a master’s degree in Development Studies from the London School of Economics and Political Science. He often joins campaign trails, a substitute speaker for his father and grants TV and video interviews for the sake of his patriarch. This gives people a hint that he might soon seek a public position. Like his father, Sandro believes in unity. His mother is Louise or Liza Araneta. She is a relative of Mar Roxas. The latter is the 2016 LP Presidential candidate in 2016. He said that relationships must not transcend politics. Like any other profession, he is also open to politics. YES GOGOGO AHEAD SANDROM MARCOS RUN FOR GOV.IN ILOCOS NORTE.LET’S GOD LEAD YOU ON YOUR GOOD WAY.